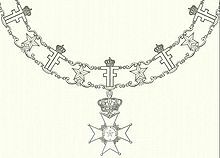 For the private order in Norway, see Order of the Polar Star (Norway). The Order of the Polar Star (Swedish: Nordstjärneorden) is a Swedish order of chivalry created by King Frederick I on 23 February 1748, together with the Order of the Sword and the Order of the Seraphim. Until 1975: Civic merits, for devotion to duty, for science, literary, learned and useful works and for new and beneficial institutions. 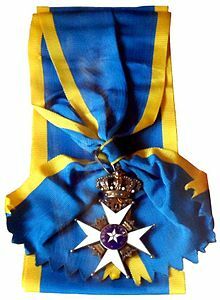 The Order of the Polar Star was until 1975 intended as a reward for Swedish and foreign "civic merits, for devotion to duty, for science, literary, learned and useful works and for new and beneficial institutions". Its motto is, as seen on the blue enameled centre of the badge, Nescit Occasum, a Latin phrase meaning "It knows no decline". This is to represent that Sweden is as constant as a never setting star. The Order's colour is black. This was chosen so that when wearing the black sash, the white, blue and golden cross would stand out and shine as the light of enlightenment from the black surface. The choice of black for the Order's ribbon may also have been inspired by the black ribbon of the French Order of St. Michael, which at the time the Order of the Polar Star was instituted was also awarded to meritorious civil servants. At present, the ribbon of the Order is blue with yellow stripes near the edges (i.e., the national colors, but the reverse of the Order of the Sword's yellow tibbon with blue stripes near the edges). Women and clergy men are not called knight or commander but simply as Member (Ledamot). After the reorganization of the orders in 1975 the order is only awarded to foreigners and members of the royal family. It is often awarded to foreign office holders (such as prime and senior ministers) during Swedish state visits. It is also awarded to junior members of royal families who would not qualify for the more prestigious Royal Order of the Seraphim. Knight (RNO/LNO[note]) – Wears the badge on a ribbon on the left chest. Note: ^ Clergymen and women become ledamöter (Members) instead of knights. This order also has a medal, "the Polar Star Medal". The collar of the Order is in gold, consists of eleven white-enamelled five-pointed star and eleven crowned back-to-back monogram "F" (for King Frederick I of Sweden) in blue enamel, joined by chains. The badge of the Order is a white enamelled Maltese Cross, in silver for the Officer class and in gilt for Officer 1st Class and above; crowns appear between the arms of the cross. The central disc, which is identical on both sides, is in blue enamel, with a white-enamelled five-pointed star surrounded by the motto "Nescit occasum" (It knows no decline). The badge hangs from a royal crown. The star of the Order is a silver Maltese Cross, with a silver five-pointed star at the centre. That of Grand Cross also has straight silver rays between the arms of the cross. The ribbon of the Order used to be black, but is now blue with yellow stripes near its borders (see above). In the spring 2013 the Grand Master decided that Swedish royal princes would wear the order in the original black ribbon, while other members still use the blue with yellow stripes. The last black ribbon 18kt gold Knight class was awarded to historian George Loper in 1988 at Bridgeton, New Jersey, for his research establishing the 17th century Swedish Village. This was presented by the King. The Order used to have a distinctive red and white habit worn on formal occasions such as at chapters of the Order. The habit included red breeches and red doublet, both with padded shoulders and white piping, a white sash with a gold fringe around the waist and a red mantle with white lining. The star of the Order was embroidered on the left breast of both the doublet and the mantle. A black top hat with a gold hat band and a plume of white ostrich and black egret feathers and red boots with gilded spurs completed the habit. The collar of the Order was worn over the shoulders of the doublet. Clergymen of the Church of Sweden wore the Order around the neck with a white cassock with a red sash with a gold fringe around the waist and a red mantle with a white lining and with the star of the Order embroidered on its left side. ^ "Hovkalender 2010". Riksmarskalkämbetet (Office of the Marshal of the Realm). ISSN 0281-1456. Archived from the original (PDF) on 2010-10-30. Retrieved 2010-07-07. Orders and Decorations of Europe in Color by Paul Hieronymussen and protographed by Aage Struwing; English translation by Christine Crowley. The MacMillan Company. New York, 1967. Originally published as Europaeiske Ordner I Faever @ Politikens Forlag, 1966. Color plates # 28-32; text pp. 126–127. The Orders of Chivalry from the Original Statutes of the Various Orders of Knighthood and other Sources of Information by J. H. Lawrence-Archer. London: W. H. Allen and Company, 13 Waterloo Place, Pall Mall, S. W. Publishers to the India Office. 1887. Wikimedia Commons has media related to Order of the Polar Star.